Vayikra/Leviticus 8:27 And [Moshe] put everything on the hands of Aharon and on the hands of his sons, and he waved them as a wave-offering before the L-rd. HaShem as a wave-offering. The verb is the Hif'il 3ms prefix form of the root , which although its Qal meaning is to sprinkle or wave, in the Hif'il stem means to lift up, to move to and fro, to wave or shake (Davidson). We can see the range of meanings being used here: the offering is lifted or raised up on outstretched arms and then waved - moved to and fro - before HaShem. The pointing in the text tells us that the second half of the verse is to be taken as two phrases: and-he-waved-them and a-wave-offering-before-HaShem. is an abstract feminine noun from the same root, meaning "a lifting, waving or shaking of the hand"; here, by metonymy it is used for "a wave offering". Ibn Ezra, on the other hand, insists that should remain unchanged, saying that it refers to Aharon and his sons: Moshe waved Aharon and his sons before HaShem. This has the support of the grammar - the verb is singular and is plural - but introduces the problem that Moshe, a man in his eighties, is physically waving his older brother and four adult nephews before HaShem. Drazin and Wagner say that both "and he waved" and "a wave-offering", must be figurative: Moshe is raising them in holiness, waving or presenting them as priests before HaShem. Baruch Levine points out that among the parts of the ordination sacrifice burned upon the altar - "one cake of unleavened bread, one cake of oil bread, and one wafer ... the fat parts and the right thigh" (Vayikra 8:26, JPS) - was the thigh, which, according to the provisions of 7:32ff, belonged to the priests. 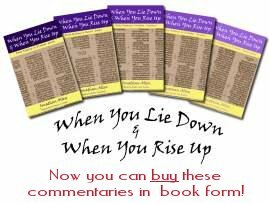 Levine comments that "in the rites of ordination, the priests surrendered their own portion to G-d, since it had been offered on their behalf, and it would have been improper for the priests to benefit from what was offered on their own behalf. Only when they were of service to others could they benefit in this way. Therefore, the procedure was altered and Moshe, as the officiant, received his portion, consisting of the breast (8:29), which he, in turn, contributed to the priests as a gift (8:31ff)." Aharon and his sons gave up everything and received nothing at their ordination as priests. The word used for 'hands', , is the construct of the feminine noun . It comes from the geminate root , to bend or bow down, and in its most basic form means a hollow place. It is therefore used in the Hebrew Scriptures for the palms of the hand, or the soles of the feet. Yeshua, who gave up everything including His own life to become our High Priest, was pierced through His hands and feet when He was nailed to the cross. He bore the weight of our sin on His outstretched arms as He was lifted up. He became not just the sin offering, but also the ordination offering, receiving nothing but giving up His spirit and leaving His physical body hanging on the cross to be buried - "his appearance was so marred, beyond human semblance, and his form beyond that of the children of mankind" (Isaiah 52:14, ESV). He "gave himself up for us, a fragrant offering and sacrifice to G-d" (Ephesians 5:2, ESV). Now, those who follow Yeshua have been appointed priests in the kingdom of G-d. John explains that Yeshua has "freed us from our sins by His blood and made us a kingdom, priests to His G-d and Father" (Revelation 1:5-6, ESV). Peter confirms this, writing to the Jewish people who believe in Yeshua that live in the Diaspora: "you are a chosen race, a royal priesthood, a holy nation, a people for His own possession, that you may proclaim the excellencies of Him who called you out of darkness into His marvelous light" (1 Peter 2:9, ESV). If we are to walk in that priesthood, then we have to answer His call and give up everything so that we may be ordained as priests of the kingdom. Notice the choice of words that the Gospel writers use to describe the way in which the first disciples responded to Yeshua's call: "when they had brought their boats to land, they left everything and followed Him" (Luke 5:11, ESV), so that later on Peter will remind Yeshua, "See, we have left everything and followed You" (Matthew 19:27, ESV). If we are called to serve as priests, then our hands must be empty and we cannot serve that call if we are looking for what we may get out of it. Our ordination offering - of ourselves - must be complete; we cannot hold anything back. Rav Sha'ul explained that, "I have been crucified with Messiah. It is no longer I who live, but Messiah who lives in me. And the life I now live in the flesh I live by faith in the Son of G-d, who loved me and gave Himself for me" (Galatians 2:20, ESV). Sha'ul knew - from the moment he met the Risen Yeshua on the road to Damascus - that his life had been called to a completely different kind of service and joy from anything he had thought possible before. Was it all hardship? Well, there was certainly quite a lot of that, but Sha'ul pressed on and experienced the joy and fulfilment of being part of the kingdom priesthood, serving the King in this world. As he told the Philippians, "I press on toward the goal for the prize of the upward call of G-d in Messiah Yeshua" (Philippians 3:14, ESV). He was not going to let anything stand in his way, echoing the words of Hosea: "Let us know; let us press on to know the LORD; his going out is sure as the dawn; he will come to us as the showers, as the spring rains that water the earth" (Hosea 6:3, ESV). So the question remains for us: Are we serving as ordained priests in the kingdom of our G-d? Have we surrendered everything to Him so that we come with empty hands, waiting for Him to give us what we need from what is His, or are we just dressed for the part while hanging on to our own stuff behind our backs? Will you cup your hands, holding your life in outstretched arms and wave it as a wave-offering to our Father, to use as He wills for building His kingdom? Application: What have you given up to serve as a priest in the kingdom? Have you, like Yeshua, humbled yourself and become obedient unto death, waiting for G-d to exalt you?